Our first WFTO UK member’s get together – at Shared Interest’s offices in Newcastle – to look at the current situation around Fair Trade in the UK, and future promotion of WFTO in the UK – especially the WFTO Guarantee System. 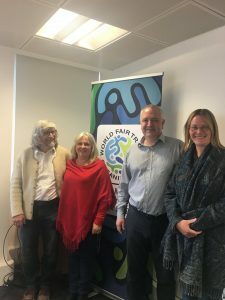 Great to have the Scottish Fair Trade Forum as a provisional Network member – that makes 2 Scottish members – one trading member (us) and one network member (SFTF). Now is the task to get more Scottish members! I like the fact that the Computer Bag from Cambodia takes pride of place in bottom right hand corner – a future product! ← Mass balancing vs Producer story? You decide!